문화버스는 학생회비와 학교지원금을 재정으로 하여 대학원 총학생회에서 기획하고 주관하는 사업입니다. 따라서 신청자가 몰릴 경우, 학생회비(2019년 봄)를 이미 납부한 대학원생에게 우선적으로 배정됩니다. 미 납입한 대학원생이 우선 배정을 받기 위해서는, 아래 납부 방법에 따라 신청 개시 전날까지(4/17) 납부 해 주시길 바랍니다. 이 때, 대학원 총학생회(gsa@gsa.kaist.ac.kr)로 이메일 전송을 꼭 해주셔야 확인이 됩니다. 대학원생 납입자 우선 배정 후에, 대학원생 미납입자와 학부생은 선착순으로 배정됩니다. - 업무: 당일 인원 체크 및 행사일 안전 관리. 버스 탑승 장소 공지 및 하차 장소 확정. 문화버스 출발 일 이전 이후로 간단한 행정 업무. * 인솔자 선정 시, 동반자 있는 신청자를 우선적으로 고려함. 3. 선정자는 4월 22일 월요일 이전에 공지됩니다. * 신청자와 동반자의 신분증을 당일 지참해주세요. 동반자만 탑승하는 것은 불가합니다. * 동반자 신청은 신청인이 납부자인 경우만 가능합니다. * 같은 우선순위의 경우 선착순으로 좌석이 배정됩니다. * 대학원 총학생회는 1학기에 두 번, 주말에 국내 각종 여행지로 왕복 버스를 제공합니다. 별도의 가이드는 제공하지 않으며, 입장료는 개인 부담입니다. * 신청하실 때 이미 승차 정원이 초과된 경우에는(신청 페이지에서 확인 가능) 대기자로 신청되어, 이전 탑승객이 취소한 경우에만 탑승이 가능합니다. * 일정에 변경사항이 생기는 경우, 이메일(gsa@gsa.kaist.ac.kr)로 취소 여부를 알려주시기 바랍니다. 정해진 시간 이후에 취소를 하시는 경우는 6개월간 문화버스 탑승이 불가합니다. * 문화버스는 15인 이상 신청 시에만 운행합니다. * 본 행사는 학교 외부에서 진행하는 행사입니다. 외부에서 발생한 사고에 대해서는 학교가 책임지지 않음을 알려드립니다. This BUS service is run and supported by GSA and school supporting association. Therefore, seats will be preferentially assigned to graduate students who paid a Student Union Fee. If you have not yet paid your Student Union Fee, you can also pay until the day before opening application (4/17) for the priority. 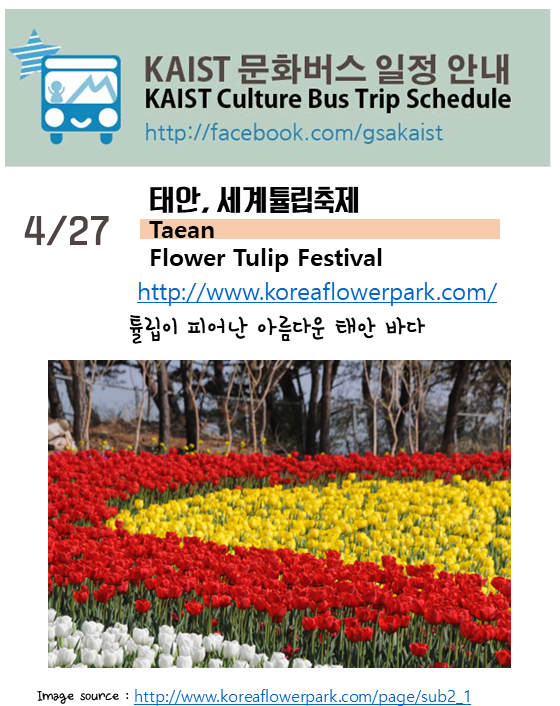 In this case, please email GSA (gsa@gsa.kaist.ac.kr) for confirmation. After the allocation, the graduate students who did not pay Student Union Fee and undergraduate students will be assigned on a first-come, first-served basis. *Student union fee should be paid only until the midnight of previous day of the culture bus to be acknowledged as payer. *Accompanying person can be registered only if the applicant paid student union fee. *For the same order of priority, the seats are reserved on a first come, first served basis. *When you register after the maximum capacity (which you can see on the registration page), you are automatically on a waiting-list. *When you have changes in your schedule, you MUST cancel your registry by the email within the cancellation period (gsa@gsa.kaist.ac.kr). If you make cancellation after the cancellation period, you can't apply culture bus for the next 6 months. *The BUS TRIP will be cancelled in case there are less than 15 applicants.